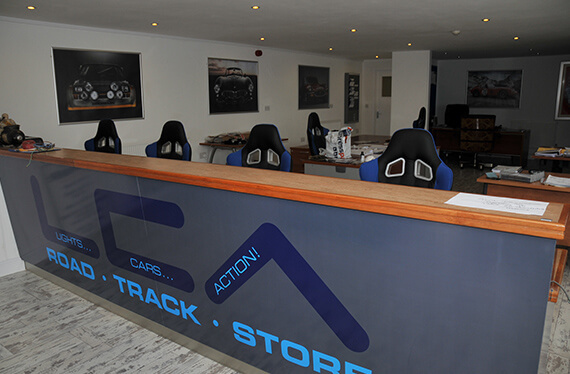 Here at Lights Cars Action we are a specialist automotive company which houses a wide range of vehicle services within our 24,000 sq foot premises. Our unique & resourceful workshop allows us to carry out maintenance, race car preparation, restoration, detailing, valet & more by our highly trained and experienced technicians. Also we have unique state of the art paint oven enabling a one stop shop for all of your automotive needs. Our facility includes a purpose built storage warehouse which allows us to offer you short or long term storage for one or more of your vehicles. The storage area is dehumidified to a relative humidity of 50-55% 24/7, which is the optimum environment for automobile storage. We also have 15 years’ experience in historic racing, running cars such as Historic F1, Classic F3, Formula Junior, GT, Sports Racers and others, at Goodwood, Monaco, Europe, South Africa & the USA. more than 1 hour away.